high levels of childhood inactivity and obesity. 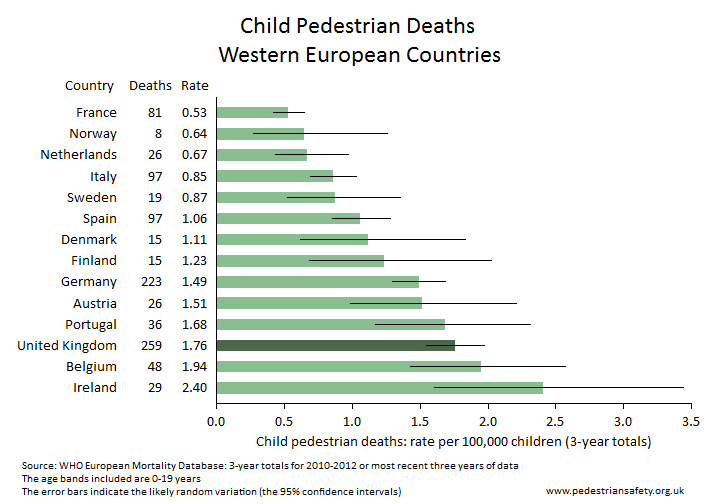 There are eleven western European countries with lower child pedestrian death rates than the UK, and five of these have rates less than half that of the UK - see below for notes and source. 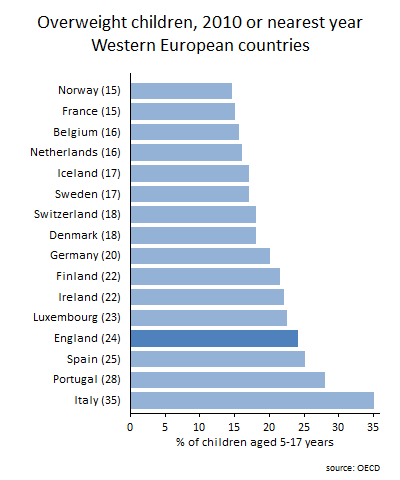 The data is taken from the WHO European Detailed Mortality Database , last updated November 2014, data downloaded 7th and 8th July 2015. The figures compared were the most recent three years of data, which for most countries was 2010 to 2012. The countries compared were western European countries with the exception of three: Iceland, Luxembourg and Malta. These three were excluded because of the small numbers of deaths (one per country) and the small populations, resulting in large random fluctuations in the rates. The error bars show the 95% confidence intervals for the rates, and indicate the likely size of the random variation - read more on confidence intervals and why they are needed at www.travelindependent.org.uk/confidence_intervals.html . The ICD-10 mortality code included were V01 to V09 (pedestrian deaths from collision with any vehicle). The age groups included were 0-19 years. The chart shows data from the 2014 OECD report . OECD (2014) Obesity update June 2014 http://www.oecd.org/els/health-systems/Obesity-Update-2014.pdf or download from here.